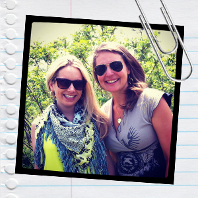 Jennifer Ger and Suzie Chemel believe that life, like fashion, should be fun, bright and full of excitement. They founded Foxy Originals on this belief and create unique and playful jewelry pieces that help young women everywhere find their own way to sparkle and shine - without breaking the bank. These stylish entrepreneurs met while studying at the University of Western Ontario, and quickly discovered their shared passion for bracelets and baubles. They decided to focus their combined talents on a single vision and founded Foxy Originals. They sold jewelry on campus and in the summer took Foxy on the road to outdoor festivals and concerts. Their inventive designs caught on, and it wasn’t long before they had a strong following of fans, always anxious to see what they’d come up with next. When they graduated with business degrees in 2003, they turned Foxy Originals into a full-time affair, and set out to make high-style fashion jewelry accessible to young women. They continued to develop uniquely styled pieces that featured colourful enamel designs, innovative shapes and clean lines. This fresh new look brought tremendous attention from fashion editors, stylists and trend-setters – Foxy was in the news and on the fingers, wrists and necklines of fashion-savvy young women everywhere. Today, Foxy counts popular celebrities and fashion influencers among the women who make up the cult following for their iconic pieces. With each new line, Foxy evolves and reinvents itself. It continues to set the trend with fashionable lines, as well as ethical business practices, including a new recycling program – the first of its kind in North America. A proudly Canadian Company, Foxy is now a top selling brand in hundreds of boutiques throughout Canada, the United States, the United Kingdom, Japan, Australia, and beyond!